The Kopřivnice truck factory, now with the Czech owners, is undergoing successful restructuring and becoming a profitable company with prospects for long-term prosperity. This is proved by production and sales data and the preliminary results for 2014 in particular. The company will publish the economic results in March at the earliest, but the preliminary results have already shown the company will end 2014 with positive results. Total revenues for 2014 amounted to just over CZK 3.7 billion, which is 24 percent increase from the previous year (revenues for 2013, including a contract for Saudi Arabia amounted to CZK 3 billion). Revenues from the sale of vehicles even had an annual increase of 39 percent. In addition to the revenues of vehicle sales and spare parts, the increased revenues from servicing activities and machining for third parties have also contributed. TATRA TRUCKS is an overall net exporter, as about 80 percent of their production is sold abroad. That is why exchange rate developments in 2014 had a positive impact on it, when the weak crown contributed to revenue growth. The TT company has sold the total of 850 vehicles in year 2014, which is 18% increase from the previous year while revenues from vehicle sales went up as much as 39%.The reason is the recovering consumer confidence in the unique TATRA vehicles, the successful presentation and testing of TATRA vehicles for large strategic customers (Ministry of Defense of Saudi Arabia, the Fire Brigade, the Slovak Republic, etc.) and TATRA’s continuous entering of new markets (e.g. Mexico, New Caledonia). The TATRA TRUCKS successful business team also manages to sell vehicles with more complex specifications, corresponding better to the specific needs of customers of all continents. Target sales for year 2014 were surpassed by 12% in terms of number of units, more precisely by 30% in terms of revenue per vehicle. The production of vehicles for 2014 reached the number of 821, which again is about 8% increase from the previous year, even compared to the target.These figures show that TATRA TRUCKS has the sufficient production capacity to cover not only increases the contracted volume of vehicles, but also increasing quality requirements of current and future customers. The company is still trying to gradually reduce the leadtime. At the turn of the year the sales of new generation of Phoenix EURO 6 vehicles were also launched as a result of a strategic agreement with a major supplier of Paccar engines and DAF cabs signed in August. Compared to 2013, the sales of spare parts also increased by 40%, which also meant exceeding the target in this area. 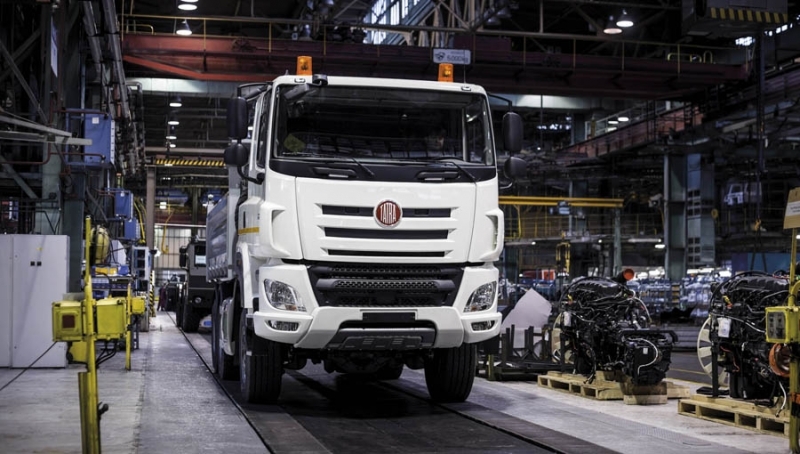 At the end of the year, 845 full-time employees worked for TATRA TRUCKS (excluding employees of subsidiaries) to achieve the objective, which was indicated in the context of restructuring steps - the number of cars sold in equal proportion to the number of employees. During the year several dozens of temporary workers were hired when needed for the flexible fulfillment of sales requirements. Furthermore for historical reasons, the company provides services unrelated to its core business to other companies in the Tatra area and the neighborhood (professional fire-fighting unit, security guarding, work safety, a canteen, etc.). These services include jobs of several dozens of full-time employees. The productivity of labor has increased by more than 66% YTD. Given the positive economic results, the employees can count on a special bonus, more precisely a share of the profits under the terms of the Collective Agreement. In 2015 the company can be expected to hire employees for some positions, especially developing ones. The company management believes that even the above improving results will help the company get more attractive for new employees who are looking for an opportunity to apply their skills in the company without restrictions or limits that are sometimes associated with work in multinational corporations and the pursuit of short-term, usually quarterly results. The above results are still preliminary and TATRA TRUCKS will gradually refine them and mainly supplement by other data of economic nature and various fields (after-sales service, quality, etc.). The joint-stock company TATRA TRUCKS has owned the world-famous truck maker Tatra since March 2013, when they acquired the company in an auction because of unpaid debts by the former owner of TATRA a.s. The new owners (Czech entrepreneurs Jaroslav Strnad and René Matera) and their key executives managed to resume production in the first half of 2013 and regained the trust of banks, subcontractors and customers. Currently TATRA TRUCKS employs approximately 850 full-time employees in the parent company and less than 500 in two subsidiaries primarily focused on casting and forging. The sales of TATRA TRUCKS a.s. in 2013 were CZK 3 billion (excluding the Saudi Arabia contract at CZK 2.6 billion. CZK). The results are the sum of the activities for the company Tatra a.s. during the period till the execution, and the contemporary TATRA TRUCKS a.s., which took over the activities of Tatra a.s. within the execution of March 15, 2013. In 2013, TATRA TRUCKS a.s. managed to produce 763 complete vehicles and sold 722 units. The sales in 2014 reached CZK 3.7 billion. The company sold 850 and produced 821 vehicles. The productivity of labor has increased by 66% YTD. At the end of year the sales of new generation Phoenix EURO 6 vehicles were launched.